We offer sveral types of posters. The four basic tybes are listed below. We also offer foam board posters, backlit posters and mini paper posters. 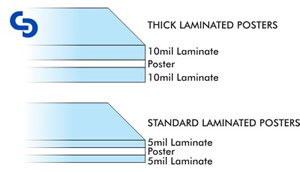 Our standard posters offer the same great high resolution color images but use a medium thickness 5mil gloss laminate for greater affordability and flexibility. Matte laminate available for a small up charge. OUR BEST POSTER, thick laminated posters offer a deeper, rich luster and are thicker and stiffer than our standard poster. Digitally printed-on-demand full-color images on photobase paper with thick 10mil gloss laminate on both sides for UV protection, durability and beauty. Put your best foot forward. Cybergraph's Economy Posters are full color poster prints on semi-gloss bright white, 135 gram photo base paper. This product is not laminated and is intended for indoor use. Printed with fade and water resistant inks. Available in several standard and custom sizes. Paper posters are RECYCLABLE. Our outdoor posters are full color water proof prints on .003 polystyrene. These posters are durable enough to last months outside exposed to the weather and sun when mounted in a sign frame. No lamination is required. For a more rigid sign, consider our 3mm PVC signs. PVC and polystyrene are RECYCLABLE - check with your municipality or solid waste collector. Full color posters printed on 80# card stock. Mini posters are perfect for using inside small frames or plexi sign holders. Lamination available upon request at a 20% up charge.